Many young adults benefit from wisdom tooth removal. Schedule an evaluation to find out more. You don't have to put up with painful teeth! Throughout human history, our bodies have adapted slowly to changes in our environment. At one time, we needed our third molars (commonly referred to as “wisdom teeth”) to break down the tough fibers in the foods we used to eat. As our diets have evolved and become softer and more processed, the size and shape of our jaw has changed. Most of us, however, still develop our third molars between the ages of 15 and 24. Sometimes our third molars come in without a problem. More often, unfortunately, the molars do not come in correctly and need to be removed for both our comfort and the health of our other teeth. The wisdom teeth may partially break through the gum but fail to erupt fully. This creates the same painful pressure but also increases the risk of infection through the opening in the gum tissue. The teeth erupt fully but are simply too big for the jaw. This leads to discomfort, pushes the other teeth out of alignment, and causes other developmental disruption. In all three cases, the wisdom teeth are at a high risk for decay since it can be difficult to brush and floss them properly. Your dentist may recommend that your wisdom teeth be removed. It’s wise to trust this procedure to an experienced oral surgeon. Sometimes, a general dentist may begin a procedure and discover that it’s more complex than was initially anticipated. This often leads to a referral to an oral surgeon. You can see yourself both time and money by going straight to an oral surgeon for your extraction. 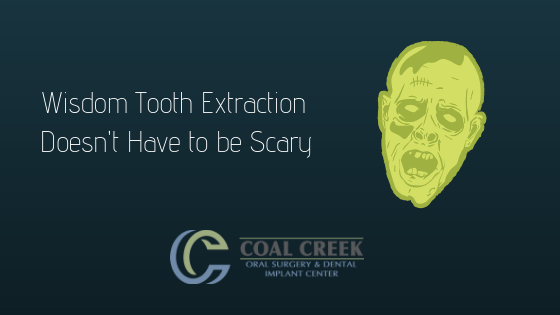 At Coal Creek Oral Surgery and Dental Implant Center, we use modern technology to plan procedures so that we can anticipate any challenges early on and include their management into your treatment plan. For instance, our 3-D cone beam scanning technology allows us to create a three-dimensional model of your mouth and the surrounding structures. Using this model, we can identify key areas of your facial anatomy (like your sinuses) so that we can plan your treatment with fewer surprises. Wisdom tooth extraction is performed here in our office using an appropriate level of anesthesia to aid in your comfort throughout the procedure. 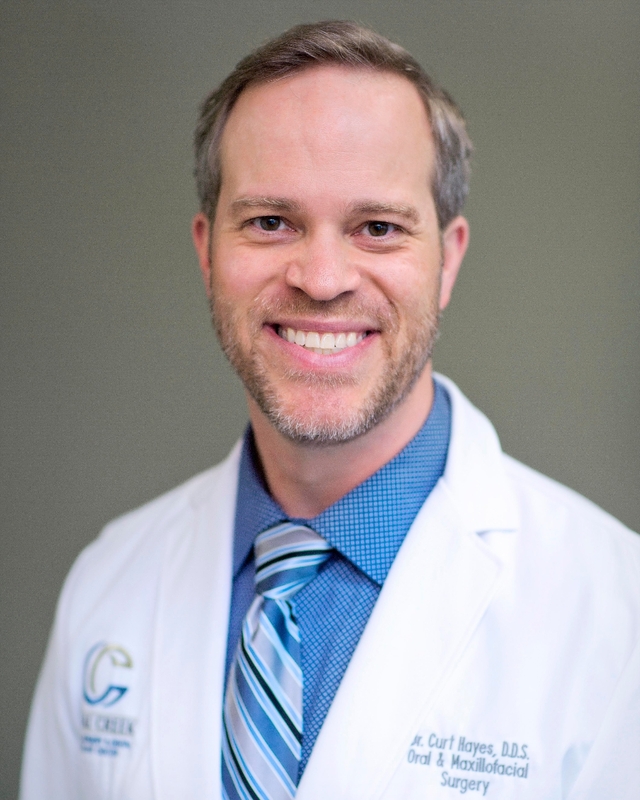 Dr. Hayes will provide you with the information you need to care for the surgical area after the procedure for faster healing with low risk of complications. Have you been told that it’s time to remove your wisdom teeth? Have you been experiencing pain or pressure? Are you (or your child) between the ages of 15 and 24? 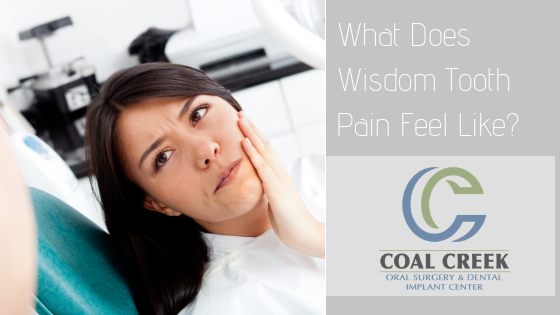 Please reach out to Coal Creek Oral Surgery and Dental Implant Center to schedule your wisdom tooth evaluation with Dr. Hayes. Protect the health of your teeth and your smile..
Impacted wisdom teeth create a lot of problems, and it’s often necessary to have them removed. This is a surgical process and it’s understandable that you are concerned about comfort. We take your comfort seriously. We’ll use local anesthetics to numb the gum tissue and the tooth before we begin the procedure. We can also provide higher levels of anesthetic when necessary, including nitrous oxide, which helps to minimize sensation and makes the appointment seem to go by faster, and IV anesthetics in certain cases. During the procedure, you are likely to feel some pressure. Some people feel anxiety about the pressure or any possible noises that might come along if the tooth needs to be removed in pieces, and nitrous oxide sedation can help reduce these worries. While planning your procedure, Dr. Hayes will discuss your needs with you and incorporate any needed anesthetic into your treatment plan. Following your surgery, after the anesthetic has worn off, you may experience some discomfort. This is normal and it can usually be managed with oral pain medications. Again, Dr. Hayes will discuss your needs with you prior to your surgery. Following Dr. Hayes’s instructions for self-care following wisdom tooth removal will help the healing process move along smoothly, and you should feel like yourself again in a few days.